Small group video conferencing has arrived everywhere. Now you can instantly transform any office or meeting space into a business-grade small group video conference room. Logitech’s ConferenceCam BCC950 is the first all-in-one video and audio conferencing device designed with small groups in mind. 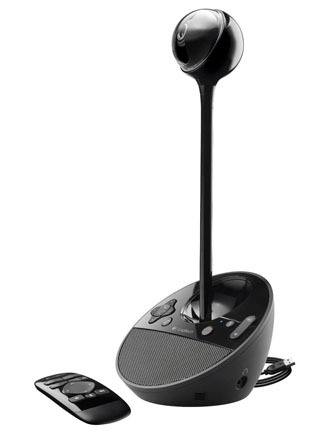 It combines a freestanding wide-view HD webcam with an enterprise-quality speakerphone in one easy-to-use, computer-connected device. Small groups can run their own video conferences anywhere in the office, without huddling around PC webcams or competing for time on overbooked conference room systems. Experience desktop video meetings so clear and razor sharp, you’ll feel like you’re face-to-face in the same room. With 1080p HD video at a smooth 30 frames per second, precision autofocus, a premium Carl Zeiss lens, and advanced auto light correction, everyone in the room can be clearly seen in professional high-quality video—even in low light or backlit conditions. A 78-degree field of view and 180-degree video pan ensure that each member of the small group is seen in your meetings. You have far more freedom to move around the room, interact together, and show presentation materials than you would with the limited field of view of built-in computer webcams. Unlike operating highly technical conferencing systems, the Logitech ConferenceCam is so intuitive that anyone in the office can easily setup and control video meetings. There’s no software to install. Simply plug the USB cable into a PC or Mac and start the meeting using virtually any video conferencing platform. The built-in full duplex speakerphone&mndash;and integrated omni-directional microphone with both noise and echo cancellation—allow everyone in the group to hear and be heard clearly up to eight feet away from the ConferenceCam. With the included remote control and console buttons, you can instantly pan, tilt and zoom the camera to focus on the entire team, the meeting leader, or detailed close-ups of whiteboards, documents, design layouts, and product demonstrations. Easy controls for answer/end calls, volume up/down and mute are all at your fingertips. You can immediately deploy small group video conferencing without a proprietary and expensive system to set up. ConferenceCam BCC950 works on virtually any desktop video conferencing and Unified Communications application.